This sparkling illuminated Jewish children's picture-book is inspired by the charming medieval Jewish work, Perek Shira (Chapter of Song). In All the World Praises You, wonders of the natural world exclaim biblical praises of God, offering hours of warm delight for young children and parents, and inspiration for older students, Bar/Bat Mitzvahs, and adults seeking fresh spirituality—a book to which adults and children will return throughout their lives. Loving spirituality, Jewish environmental ethics and the aleph-bet enchant the eye and refresh the soul. New translations and transliterations make the book delightfully accessible to all English readers, regardless of Hebrew skills. 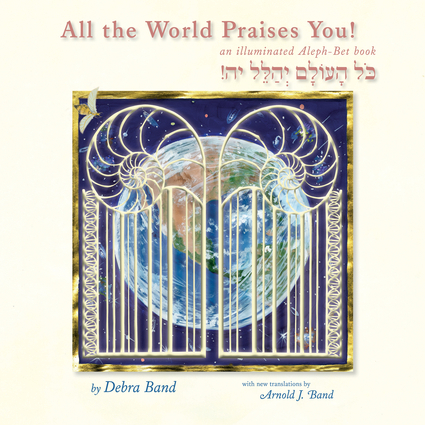 Debra Band is the author and illustrator of several books including, The Song of Songs: the Honeybee in the Garden, I Will Wake the Dawn: Illuminated Psalms, Arise! Arise! Deborah, Ruth and Hannah, and Kabbalat Shabbat: the Grand Unification. She lives in the Washington, D.C. area and lectures and exhibits across the USA.Arnold J. Band is Professor Emeritus of Hebrew and Comparative Literature at UCLA and the author of many scholarly books and articles.